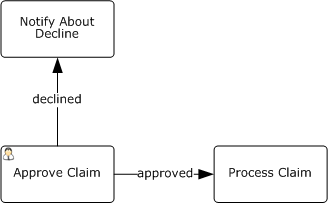 The term “process” has different meanings depending on the context, confusing BPMN beginners. This brief note should help. A process may take different paths depending on data or events, it may run in parallel etc., but it is assumed that we know all the gateways in advance - not at the execution but at design time. This is a strong assumption that doesn’t match everything we call processes in everyday life. For example it’s hardly possible to predict the route of patient’s treatment at the hospital from his admission to the emergency room. The same applies to a case in court: the opposing party may submit a document that will turn the course of the process by 180 degrees from what we’ve planned in advance. Such unpredictable scenarios should be treated as projects or cases depending on the context. If a it can’t be decomposed into tasks then it’s not a process. A process is a set of related tasks and/or sub-processes i.e. it’s not atomic. A subprocess is non-atomic too. The difference between a process and a subprocess is that a process is associated with external events (it responds to an event at start and initiates an event at completion) whle a subprocess is triggered not by an external event but simply by a control flow in the parent process or subprocess. A BPMN process has a well-defined start event, a predetermined flow of actions and defined set of completion states. “Budget process”, by contrast, isn’t a BPMN process. From BPMN perspective it’s a set of related processes (e.g. “Budget approval”, “Budget execution reporting”) plus tasks belonging to processes from other domains like “Check budget availability” in the “Purchasing” process. Similarly, “Promotion process” isn’t a process but a family of related processes in terms of BPMN. “Manage something” probably stands for a process family, too. If there is a flow in your process that returns it to the very beginning e.g. after an approval task then consider an altenative option - to end the process with a negative status having in mind that another instance may be started any time. E.g. if a hiring process didn’t succeed then it’s better to end it with appropriate status than to loop. It can be started over again, probably with different input (with a more generous salary offered). It’s better in terms of monitoring and analysis: we honestly admit that the process is not always successful. The process duration data becomes more trustable, too. The common view of a process is something processing inputs into outputs - here inputs and outputs are resources. 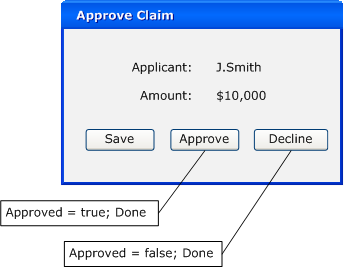 BPMN processes are different: they respond to inputs and generates outputs, i.e. inputs and outputs are events. I’ts also possible to model input and output resources in BPMN but these are optional while start and end events are obligatory. Process start is a handler of some external event, process end initiates an event in the external environment. A particular but quite common case is “none start” (free will) event and “none end” event that produces no effect to the environment. Do not attempt to use BPMN for things like “employee’s working day”. The right approach is to model processes like “Client’s order end-to-end”. 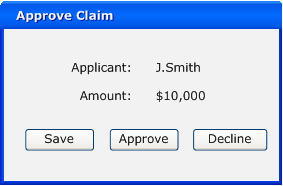 BPMN process starts when someone is willing to initiate a certain sequence of activities or when an external event (e.g. a client’s order arrived) triggers it and it doesn’t end until the very end, i.e. while there are things to do (e.g. a customers service called a buyer after shipment) . “Here the sales process ends and accounting process begins” is a bad idea - it’s a single cross-functional process, not two separate ones. Treat a process as end-to-end, ruled not by business units boundaries but by the customer’s view (external customer’s, ideally): start from the customer’s request and continue until valueable result is delivered. Switching from traditional “inside-out” view isn’t easy so use the following method: instead of modeling the saless process consider the process of buying by your customer; the process of submitting a complaint and obtaining response instead of internal complaint processing and so on. Find out what is the optimal process from the customer’s perspective. Internal consideration’s should be taken into account at some stage of process design too but it’s better to start from the customer’s view of the process. It’s possible to use BPMN for detailed regulation of a single workplace activities but it’s not why we love it. If employees are not trained then it’s a problem indeed but it’s a functional rather than process problem. And there are many solutions for it apart from BPMN. The process problem is this: employees are functionally competent (i.e. are able to do their jobs) but the whole process is complicated as it requires precise coordination of efforts of business units separated by the hierarchy and geographically. The responsibility for the handoffs and for the end result is unclear, resulting in poor overall performance. BPMN is the tool of choise for this kind of problems because it makes the interaction between participants explicit and equally clear for all stakeholders - top management, business units and “process engineers” (including IT) responsible for the process implementation. Texts about BPMS tend to focus at first hand on business process notations and diagrams. User interfaces to process tasks and web portal functionality are usually next topics, followed by business rules and integration. Such topics as data modeling at the design phase and data manipulation during the process execution are often out of sight. A recent ebizQ question «What is the most important question to ask when starting a BPM project?» collected a record number of responses. Peter did not specify the role - which side asks the question? Since the majority of active participants (writers) are BPM vendors or consultants, they proposed the question as if they were asking a potential clients. The majority agreed that the most important questions are about the context, objectives and metrics of success of the BPM project and I totally agree with this. But let us turned back to ourselves: what is the toughest question a potential customer can ask a BPM vendor? Once again, the answer depends on the context. In BPMN they aren’t business processes, definitely. From BPMN perspective business process is a specific sequence of actions initiated by a specific event and ended by some specific result. Everyone knows what a business process is. Yet it’s difficult to find two people agreeing on the term. Should they look in a book for the definition? But there are are dozens of different definitions. We must face the fact that there is no universally-accepted definition of a business process and probably newer will be. Hence it’s no use to develop the true definition and I won’t do that. I’ll try instead to explain what do I mean by the term “business process”. While talking with a client yesterday I failed to articulate clearly the difference between templates and patterns. A template is a standard solution for a certain type of tasks. E.g. when I’m going to conclude a partnership agreement I pick up the appropriate template and it becomes a zero version of the document. A pattern prinicipally is a standard solution too, but it is used creatively on the basis of a “problem shape” rather than problem’s formal type. Unlike templates, patterns may come with a positive (”how to do”) or negative sign (”how better not to do”). Debuts are templates: learn them and use them, chessbooks plot the game 20 moves ahead from the initial position. Typical combinations of the middle game are patterns. E.g. fork is a pattern: if you can see an opportuntiy then use it or threaten to do so. Two rooks on the same vertical is a pattern too while two pawns is an antipattern: try to avoid such a position if possible. But no chessbook contains instructions how to make a fork starting from the initial position. With regard to business processes, sometimes a business process model is called a process template. 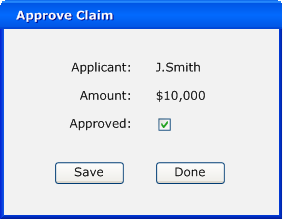 Process instances are created from templates about the same way as zero version of the document in the example above. The second meaning of the term “template” is a typical, standard process model. A vendor or consultant develops a process model on the basis of previous experience and then offers it to prospective customers. Supposedly the customer will be able to use it with small customization, saving efforts in comparison with a development from scratch. For example, my company Business Console successfully implemented a BPM solution targeting a sales process executed through geographically distributed offices and now we offer it as a template, i.e. a starting point of a BPM project to companies that manufacture and install plastic windows, metal doors, custom-made furniture etc. Pattern in BPM is a typical process fragment of typical way of communication between processes (some examples). Templates are specific (one process - one template), patterns are universal. A good pattern can be used in a variety of business processes regardless of the industry. A practical benefit of using a template may be less than expected. It usually covers the happy path only and the devil is in details - various workarounds, escalations and exceptions. The effect of using the right pattern can be large. For example, there was a case in our practice when the process plotted at 6 A4 sheets glued side-by-side was reduced to the elegant design with just 15 activities by using the right pattern. The value of the antipattern is its ability to preserve you from mistakes. The price of a mistake is unlimited in theory and sometimes it’s really big in practice. Another reason of my skepticism towards templates is the fact that in case of BPM we are targeting continuous improvement, not one-time automation. Templates, by definition, can be applied only once: during initial modeling. The ability to use patterns will remain open forever. It’s quite possible that after discovering a new pattern you will look at the processes you designed from a different perspective and will find a way to improve and/or simplify them.